1 sm Red Onion or 2/3 shallots. 2 medium tomatoes or 8/10 cherry toms. 2/3 birds eye chillies chopped. 1 Juice of ½ to 1 lime. While steak is cooking chop salad into small pieces and chop coriander inc stalks. Mint take leaves off stems. When steak cooked to your liking slice in thin strips. 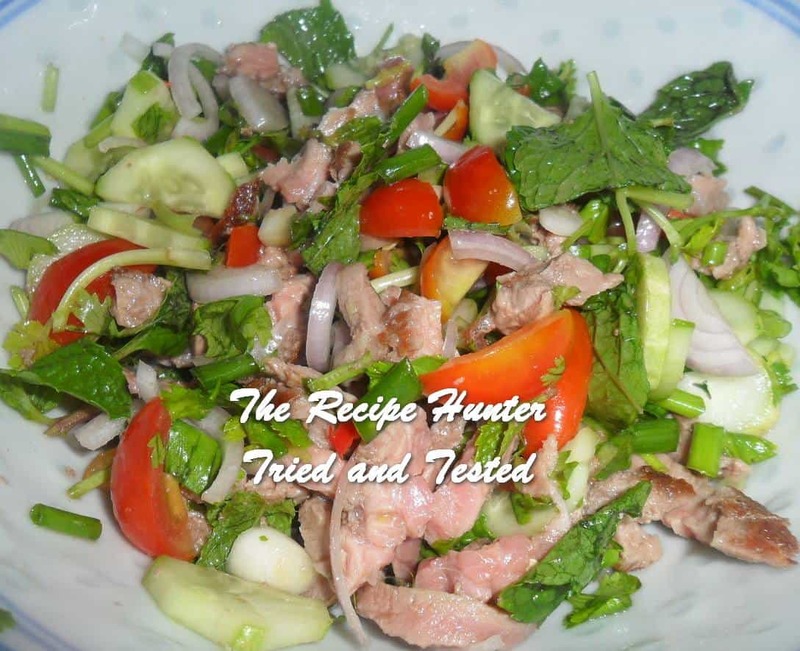 Mix gently into chopped salad add coriander, mint leaves and chillies. Stir in fish sauce and squeeze in lime juice. Taste as personally I like more fish sauce and chillies but as the taste of chillies can vary then it is down to individual taste. Far better to add less, TASTE and adjust seasoning if required. This can also be made with chicken or pork. Serve with steamed Rice or sticky Rice.